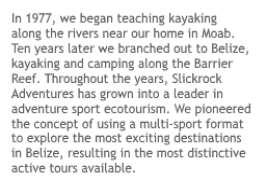 Slickrock’s primary wave-sport activity is surf kayaking. We have a fleet of high-tech sit-on-top surf kayaks with planing hulls, fins, ankle leashes, seat backs, and leg straps. 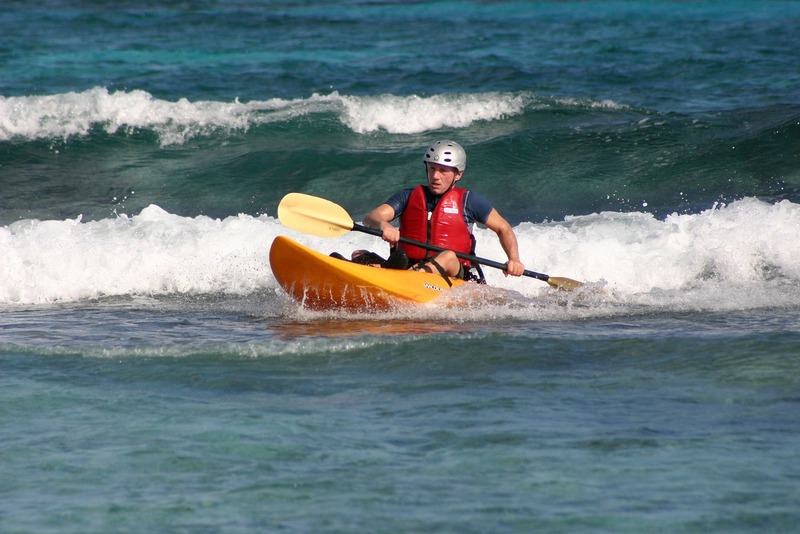 The surf kayaking on our island is great for beginning and advanced boaters alike. No prior experience is necessary. We have the perfect boats for our wave, anyone can start surfing within the hour! 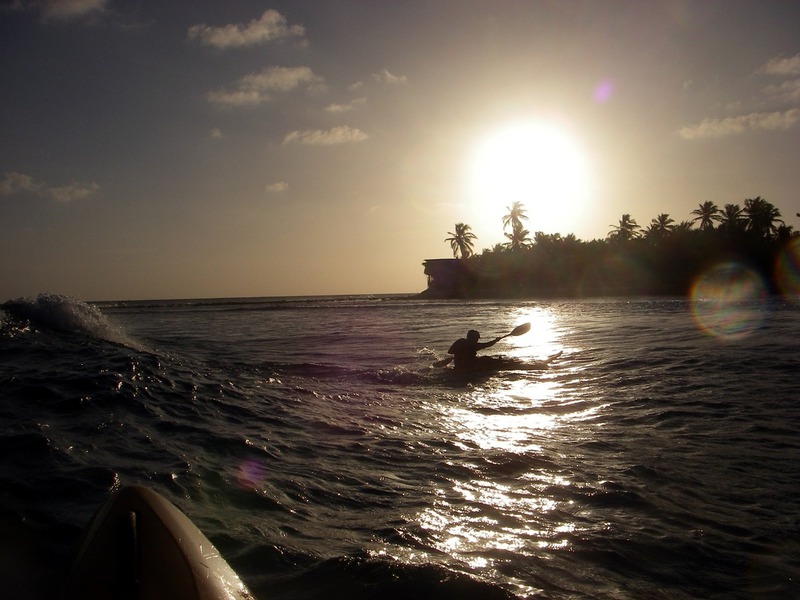 Kayak surfing at our island is not available without purchasing one of our Belize vacation packages. Our island is located far out to sea, which is one of the reasons it is such a fabulous place; we experience none of the crowding found in other parts of Belize. There is no way to visit our island only for the day, a 5-night package (3 nights on the island) is our minimum as our private boat charter only goes to and from the island two days a week. Packages include hotels and meals in Belize City before and after the trip, transport to and from the island, accommodations and meals on the island, soda and beer on the island, and windsurf and other sports gear and instruction. 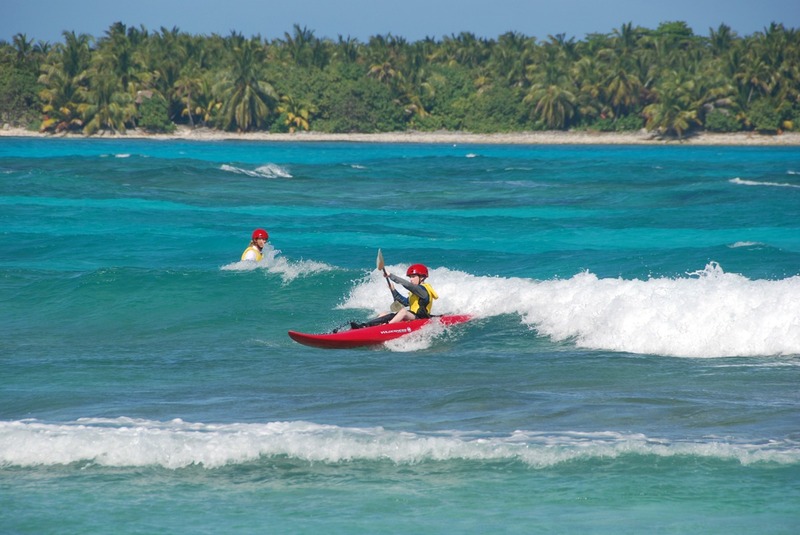 We specialize in Belize multisport trips; we aren’t just a kayak surf resort! For a complete summary of all the sea sports we offer, visit our adventure sports page. Each sport has a mandatory orientation session where we introduce our gear to you. Once you have had the orientation session, you are free to use the gear anytime you like, as long as you have a buddy. The buddy system is different for each sport, and that’s explained during the orientation. For example, a buddy while snorkeling is someone snorkeling with you, but a buddy while kayak surfing is a person on shore paying attention to your location and notifying us if you need assistance. During scheduled activities, guides are on hand monitoring your progress and a buddy may not be necessary, since the guide is effectively your buddy. -Kayak orientation. The chance to practice wet and dry exits and T-rescues, several times, in warm water, was invaluable for all our newbies. And I really enjoyed it too. -The island: your setup is perfect. Loved the showers, the laundry station and well water, the drinking water supply, the beer chest, the hammocks, the cabanas, the trails, the grounds crew, the whole deal. -The gear: Werner paddles, decent helmets and PFDs, good kayaks and surf kayaks. -Your office staff in Moab were super-helpful at every turn. 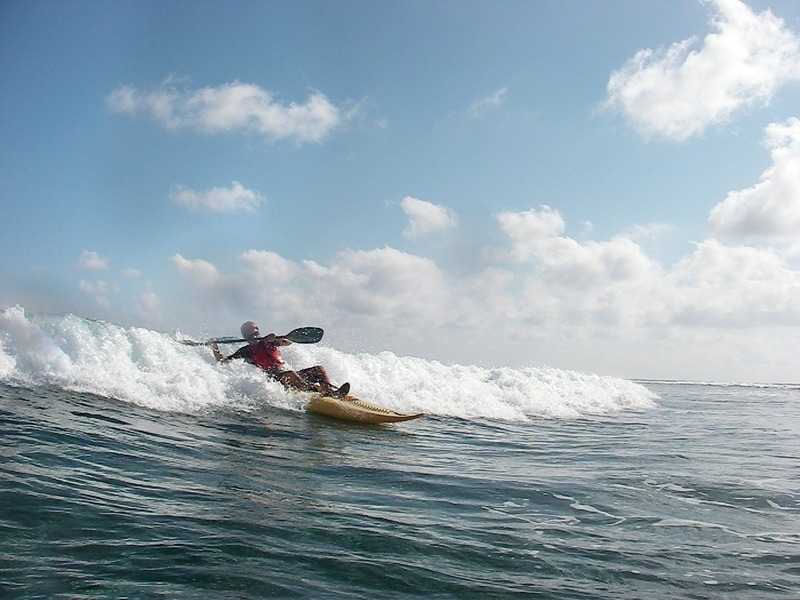 The ocean kayak surfing here is great for beginner through advanced surfers. Even those with no experience are soon riding the waves after a short orientation. Surf kayaks allow anyone to easily catch a wave since you are using a paddle rather than your arms to propel you craft, and it is easy to adjust your position to start a ride in exactly the right spot. With a few fast strokes you are on the wave, and the thrill of accelerating down its face is like no other. Steering is accomplished with rudder strokes to the back of the boat, and before reaching the bottom and out running the wave it is necessary to turn back into the wave. Ideally, the surfer will then maintain a position just in front of the break and on the steeper face of the wave. Once in this position, you will be able to stay on the wave for up to 100 yards as the wave passes over the angular shoal that creates a ‘line’ for the break to continue. Wipe-outs are no threat since you just fall out and climb back aboard. What Time of Year is Best for Kayak Surfing? Good waves can be found all year, it depends on the weather out to sea which creates the swells that form the best waves. Winter and spring are windy seasons and Long Caye will usually see a good break of four feet or higher during this time, but occasionally the seas do flatten out for a few days at a time. December through March is usually the best time to plan for waves. Last season, even the month of April had decent surf for 3 out of 4 weeks. What Do Kayak Surfers Need to Bring? No special gear is needed for kayak surfing, we have everything you need. 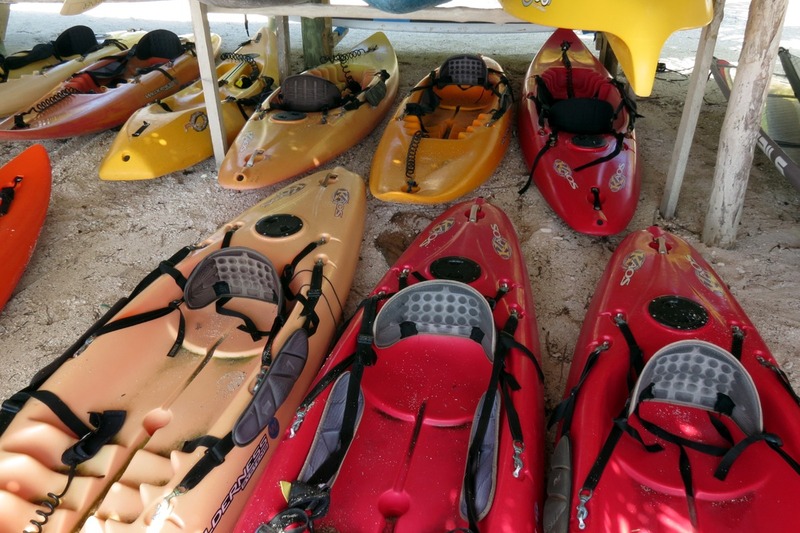 All water sports on our island do require neoprene booties, request our Adventure Island at Glover’s Reef sheet which includes the full packing list, or visit our recommended things to bring to Belize page for a description of the booties that we recommend.